The 270-WQ730 Turbidity Sensor is a highly accurate submersible instrument for environmental or process monitoring. Applications include water quality testing and management, river monitoring, stream measurement, reservoir water quality testing, groundwater testing, water and wastewater treatment, and effluent and industrial control. The 270-WQ730 Turbidity Sensor is a highly accurate submersible instrument for environmental or process monitoring. Applications include water quality testing and management, river monitoring, stream measurement, reservoir water quality testing, groundwater testing, water and wastewater treatment, and effluent and industrial control. In accordance with USEPA Method 180.1 for turbidity measurement, the turbidity sensor is a 90 degree scatter nephelometer. The sensor directs a focused beam into the monitored water. The light beam reflects off particles in the water and the resultant light intensity is measured by a photodetector positioned at 90 degrees to the light beam. The detected light intensity is directly proportional to the turbidity of the water. The turbidity sensor utilizes a second light detector to correct for light intensity variations, color changes, and minor lens fouling. The 270-WQ770 Turbidity Meter combines the turbidity sensor described above with a handheld meter that has a 6-digit LED screen, 4-button control panel, and an internal 9V battery. 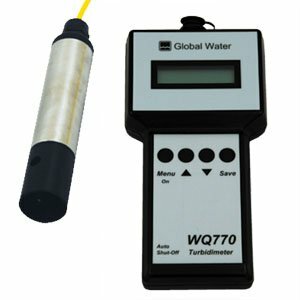 The handheld portable water meter can be used for enivronmental or process sites that do not require permanent monitoring. The meter will display readings directly in either nephelometric turbidity units (NTU) or parts per million (PPM). The meter also includes an automatic shutoff feature to conserve battery power.